The Spanish Education system has been subject to a number of reforms in recent years. Changes in Infant and Primary education have been somewhat more successful to date than those in the Secondary system. In most parts of Spain schooling is now available to children from the age of three, although the obligatory age for starting school is five years old. Children are admitted once a year in September, strictly according to the calendar year of their birth. This means that children born in January are the oldest in their class, and children born between October and December actually start school before their third birthday. The normal registration period for all ages is in May for the following September, and may be done via the local town hall, or by applying directly to a school. Educación Infantil or EI lasts for three years and teaches children about social, personal and environmental values, as well as developing their physical and mental skills. They are gradually introduced to reading and writing from 4 years old and will have covered their alphabet by the end of EI, although fluent reading ability is not expected. EI is one of the newest areas of Spanish education and is generally well-taught by dedicated specialist teachers. At six (or nearly six) children progress to Educación Primaria (EP). This lasts for six years and is divided into three cycles or “ciclos”. The objectives of primary education are planned over each two year period, at the end of which a child, who is considered not to have achieved these objectives, may be required to repeat the second year of the cycle. Students study the following subjects throughout Primary education: Spanish language; Maths; Conocimiento del Medio (A general knowledge subject which includes biology, history, geography, general and local knowledge and social awareness); Physical Education; Art and craft and a second language, usually English. In addition most students will study Religion which mainly consists of teaching Catholic doctrine. Schools are required to offer an alternative to children who opt out, but if there are not many, they may end up sitting in with another class or in the staff room with the class teacher. In some schools this time might be used to offer extra language support, but this would not be obligatory on their part. In many regions of Spain the local dialect and culture is also taught as a subject, although again, it is possible to opt out. English will be taught by a specialist, but there is no obligation for the class teacher to speak English. Classes are always mixed ability in Spain; the concept of “streaming” is unknown. The state system provides support teams of psychologist, sociologist and speech therapist which are shared by several schools, and they may give foreign children language support if they have time. Children normally have the same class teacher for each two-year cycle. Teachers make themselves available one hour a week to speak to parents about their children’s progress, which is well worth taking advantage of. There are also parents meetings every term to discuss class work and special projects and trips. From about year 3 children are introduced to termly exams, but there is no equivalent to National testing in the Spanish system. Although state education is free, parents will have to buy all textbooks and materials. Uniforms are generally not worn, except in religious grant-assisted schools. From age 12 (or nearly 12) children move on to Secondary school (El Instituto). Until about ten years ago, secondary school started at 14 and in some areas the first two years of secondary are still accommodated in the Primary building if the local Instituto is not physically big enough to hold them. The new secondary system is modelled loosely on the British comprehensive system, moving away from a two level system (similar to Grammar and Secondary Modern) to complete mixed ability schooling. The first four years are called ‘la E.S.O.” (Educación Secundaria Obligatoria). Children can leave school at the end of this section or at the age of 16 if they reach this sooner. The E.S.O. is divided into two cycles with the same system of repeated years at the end of each cycle as occurs in Primary education. One of the main criticisms of the new Secondary system centres on the discipline problems involved in teenage children who are repeating courses being placed in the same classes as younger more academically inclined children. There is still much debate about the success of reforms in secondary education, and improvements are being introduced. At the end of the four year E.S.O. students may leave school, go on to the two-year “Bachillerato” academic course, or enrol on practical training courses called “modulos”. There are four types of Bachillerato – Arts, Humanities, Natural and Health Sciences and Technology. Modulos include office and administrative skills, mechanics, catering, and hairdressing. After two years in Bachillerato students have intensive examinations during the month of May and their final mark is based on a combination of examination results and continuous assessment. A month later, in June, students who wish to go to University take a general University entrance examination (P.A.U.) and the University course they are able to follow depends on the result of this examination along with their Bachillerato results. A far higher percentage of students attend University in Spain than in Britain. There are very few University grants in Spain so sending a child to University is a major investment. Students may take as long as necessary to complete a University course, repeating courses and spreading out examinations over years. There is a general tendency to attend the University nearest to your home, and many students stay at home or live with relatives in the city to save money. The school year starts in mid-September and ends in the third week of June. There is usually a break of two weeks or so at Christmas and about a week and a half for Easter. There are no half-term holidays as such, but there are short breaks throughout the year which are organised around national, regional and local saints’ days and festivals. There are two kinds of timetables, a divided day which allows at least two hours for lunch, or the innovation of the “jornada continua”, a blocked day which finishes in the early afternoon. Most secondary schools have now adopted this blocked day timetable, so your teenager will be free from about 2 p.m. every day. In Primary school, homework is at the discretion of individual class teachers, but may be given from the first year of Primary onward. It is sometimes assumed that parents will be involved in helping children with their homework, and parents who are unable to do this for any reason sometimes pay for tutors to help their children for an hour or so every evening. At Secondary school there is usually a fairly heavy load of homework and exam studying which require considerable sacrifice and self-discipline on the part of students who wish to do well at school. Never forget that the problems of changing from English to Spanish schools is more than a problem of language, it is a problem of culture and customs as well. Many people underestimate the impact of such a change on their children, are unaware of the cultural differences involved, and may misunderstand what is happening at the school in relation to their child. The state system allows for parental involvement and you should take every opportunity to communicate with the school, with an interpreter if necessary, to iron out the kinds of problems that will inevitably arise. As a general rule the younger your child is, the easier it will be for him or her to adapt to a different school environment and pick up the language along the way. However, even as early as five or six, a child can find being thrown into a classroom where he doesn’t understand the language a disorientating experience. If your child has a tendency to be aggressive or introverted, these tendencies could be accentuated by the frustration or embarrassment of not being able to make him or herself understood, and not understanding what is expected of him or her. For all children there is an adaptation period, during which little actual academic progress should be expected. This period may range from a few months to a year or more, depending on the child, but obviously, the older the child, the longer this period is likely to be. However, this in itself should not be a deterrent to introducing children into a Spanish school at primary level, as there is still plenty of time for them to adjust and adapt. At secondary age the process is much more tricky. Firstly your son or daughter is coping with the normal problems of adolescence, which may not be helped by such a radical upheaval. Also in terms of their academic work, they are being introduced into a fairly intense academic system which is alien to them in terms of its operation and organisation, as well as its language. They will be expected to keep up with studies in a wide range of subjects with little or no support from teachers. Most children in this situation are placed in a year below that corresponding to their age for good academic reasons, but this fact in itself can cause problems at a psychological level. As a general rule, it is very ill-advised to place an English child “cold” into the Spanish system at this stage of their lives. However, there are a number of ways around this problem if you are moving to Spain with secondary age children. Firstly you should obtain a Spanish language tutor for your child in your home country for as long as possible before you intend to move. A year would be a minimum to give a child some grounding in the language. Your child should be taught not only the language itself, but should be introduced to subjects such as Science and Maths as they are taught in Spain, since many techniques and ways of calculating are very different. Also, the level of these subjects is often higher than the equivalent level in Britain, which is another reason why your child may be put down a year on arrival in Spain. After such a period of study, you would be well advised to obtain some sort of objective assessment from a Spanish national with a professional or academic background of your child’s progress and likely ability to cope at the level which will be expected. Another way around the problem which depends on your economic situation, is to place your teenage child in a private bilingual school for at least their first year in Spain to give them a kind of half-way house experience, before going totally into the Spanish system. There are many such schools in Spain, particularly along the Mediterranean coast, each with their own philosophy and educational methods. Again, you need to research these, visit them and judge for yourself their appropriateness for your own child. On an economic level, bear in mind that apart from tuition fees, you will probably also have to pay for school uniforms, text books, lunches, transport as well as extra-curricular activities, school trips and so on, so be absolutely sure what the full financial commitment is likely to be as you may not be given all these details immediately. There are particular problems which have arisen in Spanish schools which are located in areas with a high concentration of foreign nationals. 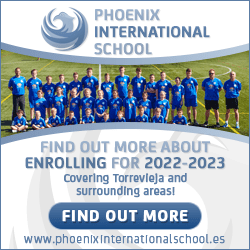 There are state Spanish schools where Spanish children are in the minority, alongside English, Irish, Scandinavian, Russian and East European children. Teachers at these schools will not speak the first language of most of their students, and local Spanish people often resent the lowering of standards for their own children that this situation implies. Bullying is another real danger here. This can go on between children of different ethnic groups, and not be dealt with adequately by the school, purely because teachers are at a loss to be able to understand clearly what is going on. This is not the fault of school staff, who as a general rule deal with such matters firmly. If your child has a bullying problem, particularly one that involves children of other foreign nationalities, you must approach the school, with a translator if necessary, and explain the situation to them. More often than not, if you approach the matter with a non-belligerent attitude, you will find staff supportive and sympathetic. If you are moving to a predominantly Spanish area, you are less likely to come across this problem, as school staff will be more aware of your children and will encourage their classmates to befriend them and make them feel welcome. If you are unable to have your children at home in the middle of the day they will have to have school dinners as children are not normally allowed to take packed lunches. Bear in mind that the menu will be entirely Spanish, and that Spanish parents expect their children to eat a good size lunch. Dinner monitors will firmly encourage your child to eat, which can be traumatic if they are used to a more relaxed attitude at home, and given that your child will not always understand everything that is being said. Your child may come home complaining of being force-fed something that he or she found disgusting to eat. You child will NOT have been force-fed, but will have been cajoled into making an effort, as all Spanish children are done by their parents at lunch time. Again, tact and understanding is needed to deal with this problem, but it can be very upsetting for your child. Please remember that the Spanish adore children, and would never be intentionally unkind to them. The fact is though, that if your child is a poor eater, he or she will have to make an effort to eat more and more varied food. Moving your children to Spain can be a rewarding and enriching experience for them. However, do not make the mistake of assuming that because they are young they will automatically adapt to their new situation, and do not underestimate the cultural as well as linguistic challenges that such a change implies. However, with careful research, patience, openness and understanding, there is no reason why your child’s move to Spain should not be a success.